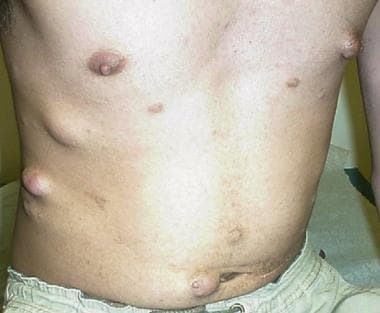 Subcutaneous and cutaneous lesions in a young man with neurofibromatosis type 2; note paucity of cafe-au-lait spots. NF2 is inherited as an autosomal dominant condition, although half of affected individuals have NF2 as a result of a new (de novo) gene mutation. The manifestations of NF2 result from mutations in (or, rarely, deletion of) the NF2 gene, located on the long arm of chromosome 22. Affected individuals need only 1 mutated or deleted NF2 gene to exhibit signs of the condition. Increasing evidence indicates that merlin is involved in a number of cellular pathways and works in concert with other proteins to promote cellular adhesion and responses via the growth factor receptor. Understanding these interactions may eventually lead to more effective targeted treatment strategies, since the benign nature of NF2 lesions makes tumors frequently less responsive to chemotherapy or radiation therapy. Numerous mutations in the NF2 gene have been identified, most of which are predicted to result in production of a truncated protein with loss of its usual function. The estimated incidence of neurofibromatosis type 2 (NF2) is 1 in 37,000 per year, with about half of affected individuals representing first cases in the family as a result of new, dominant mutations. Although the genetic change causing NF2 is present at conception, the clinical manifestations occur over many years. The typical age of onset of symptoms is in the late teens to early 20s, but the age range covers the entire life span, to include congenital forms in infancy through the elderly. [10, 11, 12] Some evidence indicates that age of onset of clinical symptoms is lower in maternally transmitted NF2. While NF2 is quite variable in severity from person to person, family studies have shown some intrafamilial consistency in age of onset. Somatic mosaicism for the NF2 mutation in sporadic cases may also complicate the clinical picture, resulting in underdiagnosis or late diagnosis. The prognosis of neurofibromatosis type 2 (NF2) depends on a number of factors, including age of symptom onset, degree of hearing deficit, and number and location of various tumors. Although age of onset is relatively similar within families, the age range can vary from 2-70 years. While the tumors themselves are relatively indolent and do not undergo malignant transformation, studies performed in the late 1980s and early 1990s showed clearly that significant rates of mortality and morbidity are associated with the diagnosis of NF2. Vestibular schwannomas are the most common and well-recognized feature of NF2 leading to significant morbidity. Symptoms of tinnitus, gradual hearing loss, and even vestibular dysfunction are frequently the initial signs of NF2. Although unilateral hearing loss is the most frequently presenting symptom, bilateral deafness would be expected to eventually occur in most affected individuals. Untreated vestibular schwannomas can extend locally and may result in brainstem compression, hydrocephalus, and, occasionally, facial nerve palsy. Nonvestibular schwannomas occur in more than half of patients and are often diagnosed in patients with an earlier age at diagnosis of NF2. Cranial nerves III and V are most commonly involved, but the rare occurrence of jugular foramen schwannomas potentially impacting the glossopharyngeal, vagus, and/or spinal accessory nerves may lead to dysphagia, esophageal dysmotility, hoarseness, or aspiration. Posterior subcapsular, or juvenile, cataracts can predate CNS symptomatology. These cataracts may progress over time, leading to decreased visual acuity. A fair percentage of affected individuals are found to have retinal hamartomas or epiretinal membranes that may or may not be visually significant. Sensory motor polyneuropathy is seen in some individuals with NF2 who may or may not have identifiable tumors along the length of the peripheral nerve(s) of interest. Patients and at-risk family members should be made aware of specific symptoms, such as tinnitus, hearing deficits, focal weakness, sensory changes, or balance problems, that might suggest tumor growth and should prompt immediate medical attention. Patients with vestibular schwannomas should be cautioned about diving and underwater activities, because of increased risks for disorientation and potential for drowning. Patients and their families may be referred to neurofibromatosis (NF)-specific regional and national support groups for continuous updates on advances in treatment, as well as for emotional support. Neurofibromatosis, Inc., for example, can be reached at the toll-free number 1-800-942-6825. The Children's Tumor Foundation has a toll-free number (1-800-323-7938) for information and to sign up for their newsletter. The NF2 Review, located in Los Angeles, CA, can be reached at 1-213-483-4431 and not only has an NF2-specific newsletter, but also has a particular research interest in NF2, with a team of specialists working on auditory brainstem implants (ABIs) and the newest surgical approaches to vestibular schwannomas. Online resources include the NIH Web site and an NF2 person-to-person support group known as the NF2 crew. Evans DG. Neurofibromatosis 2. Genet Med. 2009. 11:599-610. [Medline]. Harris GJ, Plotkin SR, Maccollin M, et al. Three-dimensional volumetrics for tracking vestibular schwannoma growth in neurofibromatosis type II. Neurosurgery. 2008 Jun. 62(6):1314-9; discussion 1319-20. [Medline]. Aboukais R, Baroncini M, Zairi F, Bonne NX, Schapira S, Vincent C, et al. Prognostic value and management of spinal tumors in neurofibromatosis type 2 patients. Acta Neurochir (Wien). 2013 May. 155(5):771-7. [Medline]. Selch MT, Pedroso A, Lee SP, et al. Stereotactic radiotherapy for the treatment of acoustic neuromas. J Neurosurg. 2004 Nov. 101 Suppl 3:362-72. [Medline]. Safavi-Abbasi S, Bambakidis NC, Zabramski JM, et al. Nonvestibular schwannomas: an evaluation of functional outcome after radiosurgical and microsurgical management. Acta Neurochir (Wien). 2010 Jan. 152(1):35-46. [Medline]. Schwartz MS, Otto SR, Shannon RV, et al. Auditory brainstem implants. Neurotherapeutics. 2008 Jan. 5(1):128-36. [Medline]. Matsuo M, Ohno K, Ohtsuka F. Characterization of early onset neurofibromatosis type 2. Brain Dev. 2013 Feb 13. [Medline]. Beltrami S, Branchetti E, Sariyer IK, Otte J, Weaver M, Gordon J. Neurofibromatosis type 2 tumor suppressor protein, NF2, induces proteasome-mediated degradation of JC virus T-antigen in human glioblastoma. PLoS One. 2013. 8(1):e53447. [Medline]. [Full Text]. Hanemann CO. Magic but treatable? Tumours due to loss of merlin. Brain. 2008 Mar. 131:606-15. [Medline]. Goutagny S, Bah AB, Parfait B, Sterkers O, Kalamarides M. Neurofibromatosis type 2 in the elderly population: Clinical and molecular features. Am J Med Genet A. 2013 Apr. 161(4):667-70. [Medline]. Ruggieri M, Gabriele AL, Polizzi A, et al. Natural history of neurofibromatosis type 2 with onset before the age of 1 year. Neurogenetics. 2013. 14:89-98. [Medline]. Goutagny S, Bah AB, Parfait B, et al. Neurofibromatosis type 2 in the elderly population: Clinical and molecular features. Am J Med Genet Part A. 2013. 161A:667-70. [Medline]. Evans DG, Huson SM, Donnai D, et al. A clinical study of type 2 neurofibromatosis. Q J Med. 1992. 304:603-18. [Medline]. Hexter A, Jones A, Joe, H, et al. Clinical and molecular predictors of mortality in neurofibromatosis 2: a UK national analysis of 1192 patients. J Med Genet. 2015. 52:699-705. [Medline]. Aboukais R, Zairi F, Baroncini M, Bonne NX, Schapira S, Vincent C, et al. Intracranial meningiomas and neurofibromatosis type 2. Acta Neurochir (Wien). 2013 Apr 5. [Medline]. Fisher LM, Doherty JK, Lev MH, et al. Distribution of nonvestibular cranial nerve schwannomas in neurofibromatosis 2. Otol Neurotol. 2007 Dec. 28(8):1083-90. [Medline]. Smith MJ, Bowers NL, Bulman M, et al. Revisiting neurofibromatosis type 2 diagnostic criteria to exclude LZTR1-related schwannomatosis. Neurology. 2017 Jan 3. 88 (1):87-92. [Medline]. Evans DG, Freeman S, Gokhale C, et al. Bilateral vestibular schwannomas in older patients: NF2 or chance?. J Med Genet. 2015 Jun. 52 (6):422-4. [Medline]. Lee HBH, Garrity JA, Cameron JD, Strianese D, Bonavolonta G, Patrinely JR. Primary optic nerve sheath meningioma in children. Surv Ophthalmol. 2008. 53:543-58. Sestini R, Provenzano A, Bacci C, et al. NF2 mutation screening by denaturing high-performance liquid chromatography and high-resolution melting analysis. Genet Test. 2008 Jun. 12(2):311-8. [Medline]. Ahlawat S, Fayad LM, Khan MS, et al. Current whole-body MRI applications in the neurofibromatoses: NF1, NF2, and schwannomatosis. Neurology. 2016 Aug 16. 87 (7 Suppl 1):S31-9. [Medline]. Otto SR, Brackmann DE, Hitselberger W. Auditory brainstem implantation in 12- to 18-year-olds. Arch Otolaryngol Head Neck Surg. 2004 May. 130(5):656-9. [Medline]. Kanowitz SJ, Shapiro WH, Golfinos JG, et al. Auditory brainstem implantation in patients with neurofibromatosis type 2. Laryngoscope. 2004 Dec. 114(12):2135-46. [Medline]. Plotkin SR, Singh MA, O'Donnell CC, et al. Audiologic and radiographic response of NF2-related vestibular schwannoma to erlotinib therapy. Nat Clin Pract Oncol. 2008 Aug. 5(8):487-91. [Medline]. Plotkin SR, Stemmer-Rachamimov AO, Barker FG 2nd, et al. Hearing improvement after bevacizumab in patients with neurofibromatosis type 2. N Engl J Med. 2009 Jul 23. 361(4):358-67. [Medline]. Mukherjee J, Kamnasaran D, Balasubramaniam A, et al. Human schwannomas express activated platelet-derived growth factor receptors and c-kit and are growth inhibited by Gleevec (Imatinib Mesylate). Cancer Res. 2009 Jun 15. 69(12):5099-107. [Medline]. [Full Text]. von Eckardstein KL, Beatty CW, Driscoll CL, Link MJ. Spontaneous regression of vestibular schwannomas after resection of contralateral tumor in neurofibromatosis Type 2. J Neurosurg. 2010 Jan. 112(1):158-62. [Medline]. [Full Text]. Gerszten PC, Burton SA, Ozhasoglu C, McCue KJ, Quinn AE. Radiosurgery for benign intradural spinal tumors. Neurosurgery. 2008 Apr. 62(4):887-95; discussion 895-6. [Medline]. Colletti V, Shannon R, Carner M, Veronese S, Colletti L. Outcomes in nontumor adults fitted with the auditory brainstem implant: 10 years' experience. Otol Neurotol. 2009 Aug. 30(5):614-8. [Medline]. Right neck mass in a patient with neurofibromatosis type 2. Facial asymmetry, OS proptosis, and exotropia, as well as several subcutaneous lesions on the forehead and face, in a 20-year-old man with neurofibromatosis type 2. Posterior cervical scar from cord lesion resection, thoracic scoliosis, and subcutaneous masses in a young adult with neurofibromatosis type 2. Meningioma to the left of midline in a patient with neurofibromatosis type 2. Multiple meningiomas (on the left) on the surface of the brain in a patient with neurofibromatosis type 2. Bilateral acoustic neuromas in a patient with neurofibromatosis type 2. Bilateral acoustic neuromas and a left-sided meningioma in a patient with neurofibromatosis type 2. Small ependymoma in a patient with neurofibromatosis type 2. Multiple meningiomas in a patient with neurofibromatosis type 2. The view(s) expressed herein are those of the author(s) and do not reflect the official policy or position of Brooke Army Medical Center, the U.S. Army Medical Department, the U.S. Army Office of the Surgeon General, the Department of the Army, the Department of the Air Force, Department of Defense or the U.S. Government.